The Connecticut house of (possibly) the first one to record seeing the Antarctic continent. Episode: 12. Site Numbers: 080 & 091. Date Posted: 22 June 1996. Update 11 March 2000. Location: Stonington, Connecticut, USA. Type: Building. Stonington, Connecticut, is a lovely old port town close to the Rhode Island border. Its history is closely associated with the fur seal trade and many sealers called Stonington home. The most famous was Captain Nathaniel Brown Palmer who "is credited with the discovery of the Antarctic Continent in 1820. . . . In later years he became a celebrated captain, merchant, designer, owner of some of the greatest clipper ships involved in the China trade. . . ." The claim that Palmer was the first to report seeing the Antarctic continent is not universally accepted but don't argue that point with the Stoningtonians! At the corner of North Water and Palmer Streets stands "Pine Point," an impressive Italianate mansion built in 1852-53 by Captain Nat and his brother Alexander. They lived there the rest of their lives. 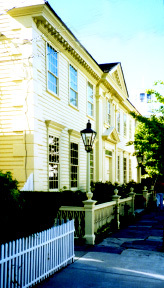 At the end of December in 1994 the Stonington Historical Society purchased the mansion. It will become the Society's headquarters. Plans are now underway for the construction of a separate archives facility. The Society hopes to have as a future collecting focus materials related to the Antarctic, especially, of course, Palmer and the Stonington sealers. The Palmer (and Loper family) papers are at the Library of Congress and include the logbook of the Hero, the sloop Palmer commanded during his 1820 voyage. A finding aid exists and the papers are described in the Library's publication: Acquisitions, Manuscript Division, 1992. [Note: Since posting this episode the Palmer mansion has been officially designated a National Historic Landmark (on September 7, 1996). Although much remains to be done in adapting the building as the Society's new home, displays of Antarctic interest at the moment include a model of the 47-foot Hero, the Captain's diddy box and some Shackleton artifacts from Cape Royds. On Water Street and not far from Palmer's house is a large and grand house (091) that bears a sign that reads: "Birthplace of Capt. Nathaniel Palmer 1799-1877 Discovered Antarctica 1820." The house apparently has been totally changed and much enlarged from Palmer's time. Palmer's grave is in Evergreen Cemetery a mile or so away. I'll leave that for a future episode.